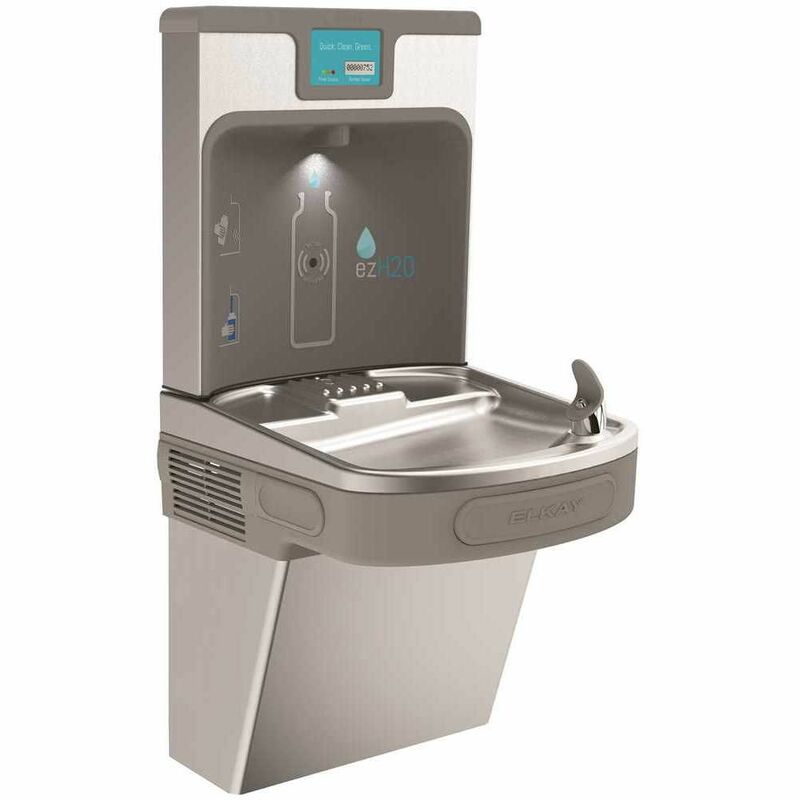 The Elkay EZH2O Bottle Filling Station delivers a clean quick water bottle fill and enhances sustainability by minimizing our dependency on disposable plastic bottles. Complete cooler and bottle filling station in a consolidated space saving ADA compliant design. Integrated look combines our Green Ticker and filter status lights. Visual filter monitor with LED filter status indicator. Fill safe diagnostic feature recognizes new filter and updates LED light back to green. Touchless, sensor-activated bottle filler designed for easy use easy-to-operate push-bar activated bubbler. Fill rate is 1.1 GPM. Commercial Electric metallic flat device cover kits provide weatherproof protection for an outlet. Flat covers are made from metal construction providing maximum durability. Includes a box, duplex receptacle, cover and attached gasket, mounting hardware and installation instructions are included. Commercial water fountains, water bottle fillers and chillers are now economical and easy to repair using JAG replacement parts. These JAG Plumbing Packs contain parts that are made specifically to work with ELKAY, Hawes, Halsey and Sloan brand water fountains. JAG Plumbing Products strives to bring on-line Customers the best replacement and repair parts available for the North American market. Experts in the field of repair parts; JAG Plumbing offers customers a selection of economic solutions for their every-day commercial plumbing repairs. The Team at JAG Plumbing Products scours North America to bring customers unique, hard to find parts of the highest quality. Enhanced Bottle Filling Station With Single Ada Cooler, Filtered, 8 Gph, 18-3/8 X 19 X 39-7/16 inch, Stainless Steel The Elkay EZH2O Bottle Filling Station delivers a clean quick water bottle fill and enhances sustainability by minimizing our dependency on disposable plastic bottles. Complete cooler and bottle filling station in a consolidated space saving ADA compliant design. Integrated look combines our Green Ticker and filter status lights. Enhanced Bottle Filling Station With Single Ada Cooler, Filtered, 8 Gph, 18-3/8 X 19 X 39-7/16 inch, Stainless Steel is rated 4.4 out of 5 by 9. Rated 5 out of 5 by Po from This water fountain was easy to order, assemble and pick-up... This water fountain was easy to order, assemble and pick-up (i.e., lightweight). The produce is quiet and easy on the eyes. I am pleased with the product and was able to make use of the filtered water immediately without problems. Rated 5 out of 5 by Junior from Excellent water fountain i would recommend to anyone. Excellent water fountain i would recommend to anyone. Rated 4 out of 5 by Charles from Product is excellent, but installation is tough. We use this... Product is excellent, but installation is tough. We use this fountain to replace an old one, and the water in/out, power outlet configuration of the old drinking fountain would not fit into this new one. We had to modify our drain, and cram everything into such a tiny space it is almost impossible to turn on the water valve. We spent the whole day to get it on. Rated 5 out of 5 by Dustin from The product was shipped quickly and performs as advertised. Keep... The product was shipped quickly and performs as advertised. Keep up the great work guys and gals! Rated 2 out of 5 by Bryan from The bottle filling station seems to short out and I... The bottle filling station seems to short out and I have to once a week unplug it to reset the filling station numbers. Can the Elkay Enhanced Bottle Filling Station be mounted outside? Can it be drained of water so that it will not freeze and break?